THE way this Division 1B competition has taken shape, a winner-takes-promotion clash between Limerick and Galway on March 4th is now probable. Mired endlessly in the distinctly less glamorous second rung of League hurling, no team possesses as urgent a spring aspiration for 2018 as John Kiely’s team. 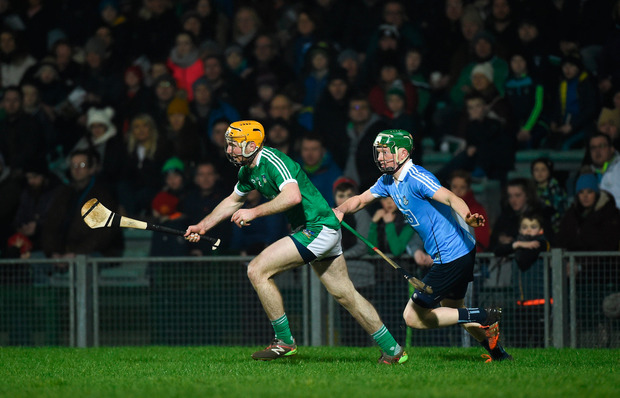 They moved one step closer to that crack at freedom with an authoritative 12-point victory over an undercooked Dublin at the Gaelic Grounds last night. With Antrim to come next week, it looks increasingly likely that that March 4th game in Salthill will serve as a de facto Division 1B final. The possibility that Dublin might challenge that duopoly this spring all but evaporated in their opening night loss to Offaly in Croke Park but despite having just a single point victory over Antrim to show for the exertions so far under Gilroy, the structure of this competition means that a spot in the quarter-finals of the League still remains a more likely outcome for them than a relegation play-off. They are, however, some way off being competition with any Division 1A team just now. Limerick won this easily and by the end, looked like they might even have had more players on the pitch. Star of last year’s All-Ireland Under 21 winning team, Aaron Gillane, who was only cleared to play before throw-in after a recent hamstring injury, scored 1-9 (0-7f) of their total, including the first half penalty that essentially confirmed the destination of the points. Seamus Flanagan burned Bill O’Carroll for pace and passed to debutant Barry Murphy, who was fouled by Dublin ‘keeper, Alan Nolan. Nolan stood no chance with the penalty, though he did make three good saves elsewhere in the game. Tom Morrissey, Limerick’s centre-forward, was another to excel, scoring four points from play but Dublin’s methods played into their hands. Dublin didn’t so much hunt in packs so much as scurry about the scarred Gaelic Grounds turf in solo foraging missions, too basic a tactic for Limerick on the night. Every time Limerick hit a wall, they simply went backwards and took points from long range. Dublin’s bright sparks on the night were few. Fergal Whitely worked doggedly. Eoghan O’Donnell and Chris Crummey were secure at the back. And Danny Sutcliffe showed glimpses of his old form. But with Declan Hannon superb at centre-back in his first game of the season and Flanagan a constant, creative presence, Limerick eased to their two points and a likely crack at the All-Ireland champions for that long lusted-after promotion.